Well hold on right there because you need to know a couple of things before you go to sell your jewelry. First thing is to set your expectations. 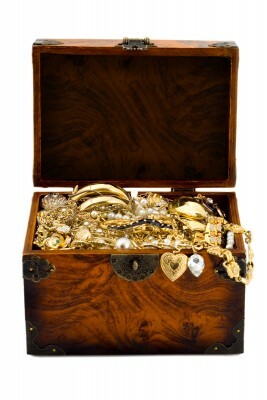 You may think your jewelry is worth a lot, but it actually may be worth little. That’s not to say however, that it’s not worth anything so here’s some tell tales signs that you will make less than you thought. We will go into this in more detail later, but while you may have paid a hefty penny for your piece that your looking to sell, it may be fake. Hopefully after reading this you will be less likely to be scammed. The reality is that there are many gold and jewelry buyers alike who will be willing to buy your generic looking jewelry for the price of it’s materials. While this may be a little bit exciting, do know that the price of the material on the market of take for example; gold will not dictate exactly the amount you will be paid for it. This is because it’s based on what someone is willing to pay for it. Your ounce of gold may be worth 1200 according to the commodities market, but not if your buyer isn’t willing to pay 1200. Lastly is if your jewelry is made of inexpensive materials and is mass produced. Your piece of costume jewelry may look nice but if it’s materials and craftsmanship isn’t worth much then it’s likely not worth much. It may be just better kept by you if it holds any sentimental value. One of the first places that come to mind is through online means. So, to help you with your selling efforts here’s the top 2 sites to sell your jewelry that you’ve likely come across. 1. Etsy: the biggest marketplace for handmade goods, this site is the one to go to for selling your own handmade jewelry. That’s the problem here, you may have some actual handmade jewelry that you want to sell and this would be a great place for it. However the site does not allow for reselling jewelry. You can ignore this fact and try it anyway but because it is the biggest handmade items marketplace there’s also a good chance that your item will be overshadowed and not seen. 2. eBay: the classic internet marketplace where you can find pretty much anything, and sell pretty much anything. This includes all your jewelry. Best part is that the first 50 listings of each month are free as well, and shipping receives discounts. Problem with this site however, is the fact that there are many fake items for sale and their low prices may leave your items unseen. Along with that is the fact that the selling fee is taken as a percentage of your final sale price. This could easily dig into your pocket as jewelry sold can be very expensive. Selling your jewelry online is great but you face the issue of having customer complaints and having your payment refunded, especially if you don’t know your own jewelry very well. One of the worse cases is if your customer issues a complaint, asks for a refund and you comply after they send back the piece only to find out that they have done something such as switching out the piece you sold, or damaged it in a detrimental fashion. Overall, selling jewelry online is best suited for lower end jewelry so that risks of fraud are lessened for both the buyer and the seller. Not to mention that if you don’t know your jewelry very well that you may be underselling yourself. If anything, perhaps you can go get your jewelry appraised first through a reputable buyer that we will go into detail about what your jewelry is worth before you attempt selling it online. But before you go to a reputable buyer it’s important to know what to look out for to find an actual “reputable” buyer. It’s all too common to find “we buy gold people on the sides of the street, but these are likely not the guys to go to. Hopefully you live in a city where more reputable buyers are available. Any reputable buyer should have a record with the better business bureau such as Luriya. They should also have tested weighted scales to ensure maximum accuracy. Also make sure to look for their reputation via reviews on the internet or just word of mouth. Finally, trust your gut instinct, if a place seems shady don’t go to it. Do your research and look around. When you do get to the buyer, here’s the things you should look for. They offer payment on site. Don’t take payment plans. Most importantly, DO NOT LET YOUR JEWELRY LEAVE YOUR SIGHT. Makes sure your jewelry is tested in front of you, shady things can happen when it leaves your sight. Now obviously you go to jewelry buyers with the expectation that your jewelry is real, but it’s also a sad truth that to get themselves a better buy price some places may tell you it’s fake when it’s real. Not only that, even your jewelry itself could by lying to you with fake markings and labels. So here’s ways to tell how some common jewelry materials are real. But before we get into that, let’s go over some of the common tools you’ll need to prove authenticity. All the following are very affordable and can prove to be worth investing into because you will be better educated when it comes to your jewelry piece upon selling, thus possibly netting higher amounts of cash. Now before we go into specific tests for authenticity here’s a couple common ones. Magnet test: most precious materials used for jewelry tend to not be magnetic. While putting your jewelry up to a kitchen magnet may not do much to prove authenticity, putting it up to a strong earth magnet like the one mentioned above will. Scratch and acid test: This is each a test on its own, but together they are even more accurate. You will want to scratch your jewelry in question on a scratch stone then apply the corresponding strength of acid and look for any color changes or fading. To be a bit more specific, let’s pretend you have an oddly numbered 16-karat gold chain. You will scratch it on the scratch stone in several locations and then apply a 10-karat acid to one of the scratches. No loss of color or dissolving should occur. You then apply the 14-karat to another scratch and once again, no or little loss of color should occur. You then apply your 18-karat acid and will observe that the scratch mark is gone or is quickly dissolving. Thus you conclude that your piece of gold is in between 14 and 18 karat. Gold is probably the first thing that comes to your mind when selling jewelry, hence the all too common “we buy gold” signs that you may have run into. It’s no surprise either because it’s worth quite the pretty penny, just not if it’s fake. 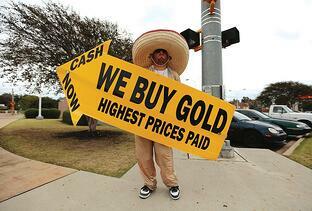 Here’s a couple ways to tell if the gold you’re looking to sell or even buy is fake. You may have seen people bite gold, and this is a real test. Upon biting pure or very high percentage gold it should leave bite marks. However this test is not recommended as not only can you damage your teeth and gold in the process, but there is also gold plated lead which will appear to be gold because it’s even softer than gold. Look for discoloration on areas that face friction. If you see any blackened areas, there’s a good chance that it’s at best, gold plated. The magnet test works here as gold is not magnetic. The acid scratch test is a great indicator for gold authenticity as mentioned above with directions. Karat, by the way, spelled with a k is used to indicate gold percentage. 24 karat is 100% pure gold. To convert karat to gold percentage, take the karat number then divide by 24. Followed by multiplying the result by 100. So take 14 karat for example. Diamonds are a girl’s best friend is what they say. They’re also pretty good friends for your wallet if you can mange to fetch a good price for one. That’s why there are so many fakes of diamonds out there on the market, and when it comes to talking about fake diamonds you’re likely going to come across cubic zirconia. Breathe on your diamond in question. If the fog stays for any more than 3 seconds then you likely have a fake. This is because diamond is excellent at dispersing heat. You may not see any fog at all, and that’s even better, that’s how fast it should dissipate. Heat up your diamond with a lighter, stove, or some other heating element for about 30 seconds followed by tossing it into a glass of cold water. A fake will shatter due to the rapid expansion and contraction. Put the diamond in question in some water and see that it sinks. 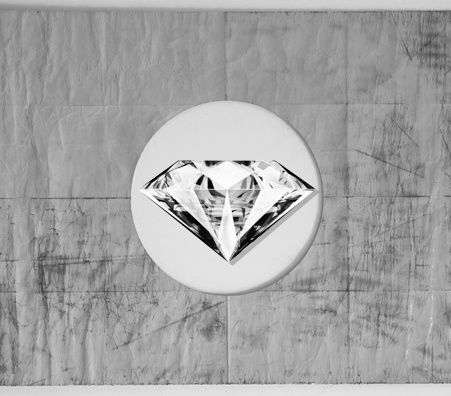 Diamonds are very dense and should always sink. Those were some simple tests to see if you have a real diamond, so assuming it failed the tests (or even passed), let’s now look at how to identify what your “diamond” may be. Let’s start with how if your diamond passed the tests that it may be a synthetic diamond. In other words, a diamond made in a lab. Some of the better ones are made by the well-known Swarovski. Unfortunately, it’s very difficult to tell if your diamond is synthetic and only to the most trained professionals are the differences apparent. Unfortunately, while the genetic makeup of these synthetic diamonds is identical, they fetch a lesser price. It’s best to not get into this situation in the first place, so if you have or are looking to buy a diamond, make sure to get a GIA certificate or something similar with it. When it comes to silver you’re likely looking to find sterling silver which is in other words 92.5% pure silver. Jewelry typically isn’t made with any higher percentage because silver by nature is very brittle. So here are some of the signs to look out for to see if you silver is real. The magnet test: put a strong earth magnet up to your piece of jewelry and it shouldn’t attract. Slight attraction may indicate that it has lower percentages of silver. The ring test: silver produces a distinct ringing sound when tapped or hit. This test may be difficult to use if you don’t have a control subject of another metal such as iron. Emeralds have been a long time favorite of jewelry and gem collectors but what you may not know is that some emeralds can even fetch higher prices than diamonds. Because of facts like this it’s not uncommon that you will find fakes floating about in the market so here’s some signs that your emerald could be fake. Perfection, that is, perfection on the inside. Naturally occurring emeralds have inclusions which are particles within the gem. 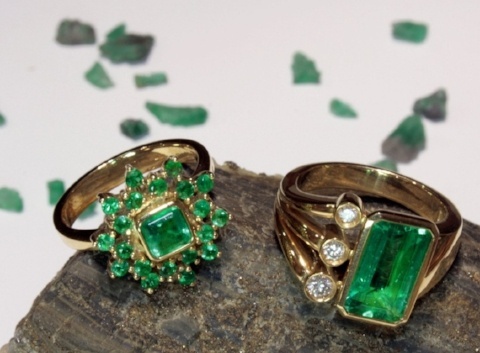 If your emerald sparkles, it’s likely fake. Emeralds don’t sparkle. If your “emerald” has layers then it too is likely fake. Pearls are common materials for jewelry, but it may be difficult to tell if they’re real. 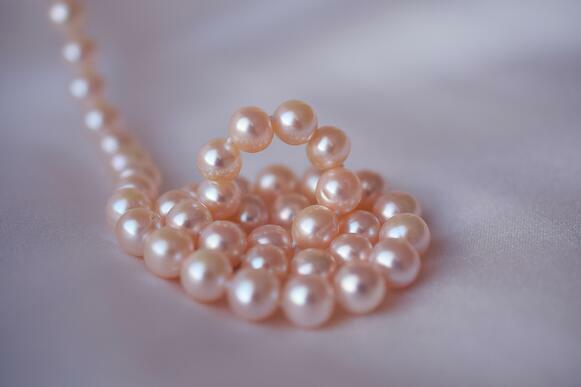 It first starts with the fact that your pearls should not be completely symmetrical to one another. This is because pearls occur in nature in the mouth of an oyster due to be agitated from sand. The tooth test: don’t do this test like you would the biting one. Instead rub one of the pearls across or in between your teeth. It should feel gritty, similar to sand paper because after all, pearls are formed from sand. 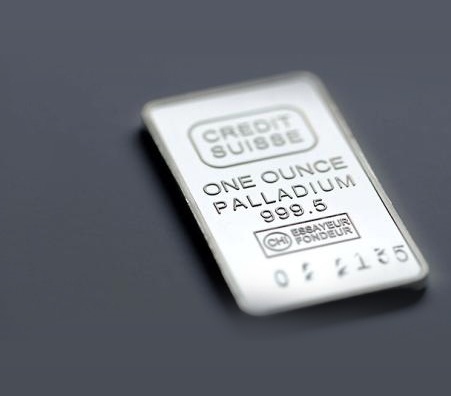 You may not have heard of palladium but it’s a more precious and commonly used metal than you think. It’s often used for rings or other valuable objects as unlike silver, it does not tarnish and is extremely durable. The best way to test if you have palladium is through an acid test. This video will show you what to look for. Platinum is like the more expensive cousin of silver, it’s harder to come by and is more expensive but they both look similar. It’s much more expensive, so you wouldn’t want to swindled for your piece of platinum jewelry for some silver or vise versa. Here’s how you tell if you have some real platinum. 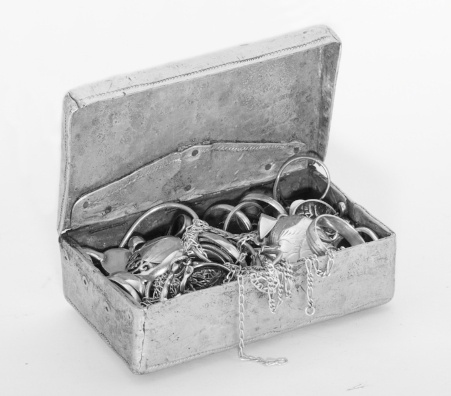 The magnet test: platinum is another metal that’s not magnetic but if you find that your platinum in question does attract, don’t yet fret because it’s not uncommon for platinum jewelry to be combined with cobalt which is highly magnetic. Hydrogen peroxide: which is available at common household stores is what you can use to identify real platinum. Platinum is a great catalyst for hydrogen peroxide, fancy talk for being chemically reactive. So put your platinum in question into some and you should see bubbling almost immediately. This does not damage your platinum jewelry either. Now that you know how to tell if your common jewelry materials are fake and thus worth less, you also know when they’re real and worth more. Here’s a couple more tips to help educate you on selling your jewelry and leverage your selling power. As mentioned before, if your jewelry is made of fake materials then that may be an indicator of why no buyer is willing to pay much for it. Use the tests above to try to make sure of such a conclusion. 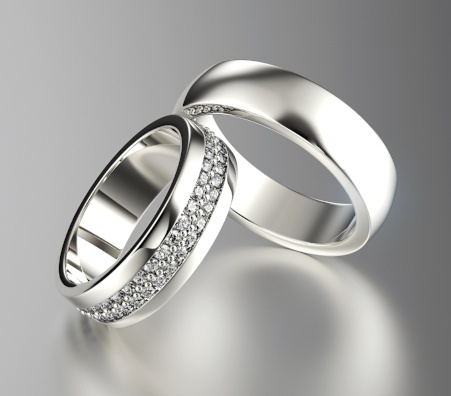 Sometimes, or rather frequently your jewelry may not be fake but just plated with a more precious metal. Plating means that your jewelry is covered in a thin layer by said material such as silver or gold. While that may sound great it unfortunately does not lead to much value as the amount used for the plating will often not add a very significant value (when compared to if the plated material was most of the piece). Still better than not being plated at all though! Having a gem or jewelry certificate of authenticity such as a GIA certification helps the buyer more quickly identify your piece. Although it’s rarely necessary to have such paperwork on hand, it’s always nice for streamlining the process. Here is where we will talk about the very commonly spoken about 4 Cs of gems. You will likely hear these being mentioned when selling any type of gem. Different gems have different qualities in each of these categories. Thus, the qualities you look for in an expensive diamond are not the same that you look for in, let’s say an emerald. The cut is the shape of your gem. See, gems are cut from a raw material to form the recognizable cuts such as cushion, princess, or round. Clarity refers to how clear the gem is. Depending on the type of gem you may want it to be completely clear, or with inclusions. Color refers to the color of the gem or stone. Different gems have different colors that they look for. Take for example how in emeralds, the most sought after feature of these 4 Cs is the color. Carat spelled with a C refers to the size and weight of a gem or mineral. A carat converted into the metric system equals roughly 0.02 grams. Make sure to not get this confused with karat, spelled with a K which indicates (most of the time) percentage of gold. Lastly comes the craftsmanship that comes with a piece of jewelry, one of the likely most important factors when deciding the worth of a piece of jewelry aside from it’s materials and the 4 Cs. Markings from a reputable jeweler such as Tiffany & Co help but there are other things in the realm of craftsmanship that help as well, especially for your costume jewelry if it doesn’t seem to be made with any precious materials. The first is the age, old things can be worth money. That’s about it really, because after all there’s a whole sub-genre known as antique jewelry. Specifically, for this type of jewelry, you should look into an antique buyer who will have a better trained eye for your item. Especially if it isn’t made with any particularly precious metals. What’s the main idea here? Selling jewelry for the best or even reasonable payout isn’t an easy task. You may think that your jewelry is worth X amount but almost all the time your buyer is only willing to offer much less for it. To decrease your chances of being swindled and to give yourself a better idea of how much your jewelry is worth, it’s best to do your research and test for authenticity yourself. Remember, it’s must harder to cheat an educated seller than it is one that isn’t sure of what they are selling!